We all know the old adage that you are what you eat. We also know that the same is true for our pets; the better quality the food we feed to our cats and dogs, the fewer health problems, fewer vet visits, and the happier the pet. And yet we still have a tendency to continue to feed our pet birds the same old diet that we always have. While seed has long been considered the standard for birds, there have been some major advances in diets and understanding a bird’s nutritional needs. Seeds are very high in fat and lacking in vitamins and minerals. Black sunflower seeds, found in many bird seed mixes, are not only lacking vitamin A but will drain this important nutrient from your bird’s body. Add to it that most birds are picky eaters and will pick out their favorite pieces and you have a recipe for a very unbalanced and unhealthy diet – and an unhealthy bird, too. Nutritional deficiencies in birds are hard to diagnose and build up until symptoms show. 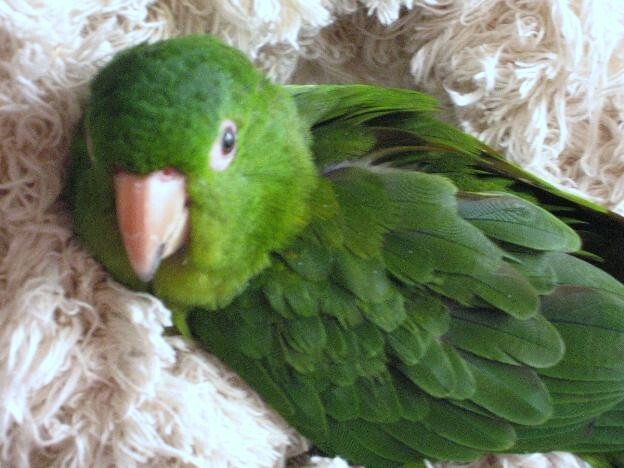 They can begin with nasal discharge, dull and lackluster feathers, and low energy levels. Over time, it can lead to respiratory infections, blindness, trembling, seizures, paralysis, and death. The high fat content of seeds can lead to a disorder called fatty liver disease. ZuPreem: Formulated with fresh ground fruit for a taste and aroma birds love. 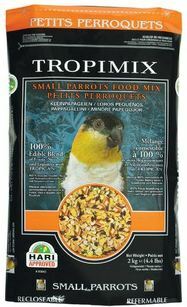 ZuPreem has five fun shapes and colors to allow your bird to forage naturally while still getting a balanced diet with 21 vitamins and minerals. Uses natural preservatives. Roudybush: Formulated by avian nutritionist Tom Roudybush, this great nutritionally balanced food is made with all natural ingredients and no artificial colors. It has a great apple scent to encourage your bird to eat. Switching your bird’s diet can be tricky, and major dietary changes should be discussed with your avian vet. Birds can be quite addicted to their seeds, like kids can be addicted to chocolate. While birds can resist change, there are some tricks that you can to do transition them to a healthier diet. Some birds can switch over when their owner mixes it in gradually increasing amounts with their seed. Feed birds at their natural eating times: morning and afternoon. Smaller birds like cockatiels, budgies, and other small birds forage on the ground; take advantage of this by placing the need pellet on white paper in the bottom of the cage. Try putting the food on a mirror, as they’ll often eat more readily with a “flock mate”. Larger birds eat high in the trees, so place the new food in a dish up high. Rearranging their cage can help, as it excites them with the sense of the new. Mix pellets with shredded newspaper or very small toys, like wooden buttons. This may help mimic normal foraging behavior. Offer the new food as a treat for a reward. Grind the pelleted diet in a blender, add some water, and mix some millet (or other favorite food) into this mash. Your parrot will have to go through the mash to get his favored food. This works well with smaller species such as budgies, lovebirds and cockatiels. Remove the mash after several hours to prevent spoilage. To switch my conure to a pelleted diet, I acted like I was eating her new food, enthusiastically pretending to enjoy it . This made her want it, I added it to her food dish, and she went right for it. When changing a bird’s diet, monitoring their droppings is important. Placing antibacterial bird cage liners on the bottom of the cage can allow you to see the form, composition, and size of droppings. Any decrease or imbalances can imply that your bird is not eating enough, and might mean that your bird needs to go back on seeds for a short time. Weighing a bird before and during a diet change will allow you to monitor their food intake, also. The key to optimal parrot health is to provide a varied and balanced diet. Seeds can be offered, in small amounts, with pellets and fresh fruits and vegetables as the main part of the mix. Most things you eat can be given to a bird, but avoid avocados in all its forms, as it is very toxic. Learn what fruits your bird likes, as everyone has their favorites. My conure enjoys anything she can juice, like apples, grapes, and cherries. You can offer protein in small amounts in the form of scrambled eggs and cheese. Whole grain pastas and breads can be offered as treats. Keep the salts, fats, and sugars to a minimum, and avoid caffeine and alcohol; their bodies are small and their metabolism is fast, and they cannot handle these items. Feeding a balanced diet for a healthy bird can be easy and fun. Sharing your food, seeing them get excited when you walk in with your plate knowing that dinner is coming is great. More importantly, feeding a balanced diet is vital to keeping your feathered friend happy, healthy, and with you for as long as possible. Lafeber’s diets are coming back! 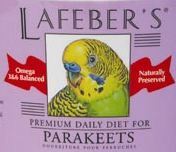 We are bringing back the entire line of Lafeber pelleted diets! Switch your bird to a healthier diet with our care sheet here. Tropical food granule-based formula with a natural blend of healthy grains, legumes, fruits and vegetables. Truly appetizing and nutritious super premium food, 100% edible, no wasteful shells.